The future delivered now. Allied Vaughn. Powering today's leading entertainment supply chain. For content providers. For re-sellers. For consumers. As a content owner, you invest in every title. Time. Risk. Money. It’s all there. Allied Vaughn is here to help make that investment pay off – with licensing, manufacturing, and selling innovations that minimize your financial risk and maximize your marketing opportunity. Looking to generate more sales from your web retail site? Allied Vaughn has over 15,000 DVD titles from over 150 studios, TV networks, and independent distributors – with hundreds more added each month. Getting set up is easy. Never a stock-out. And, lots of promotional support. Flexibly delivering content to users when they want it turns an asset into revenue. 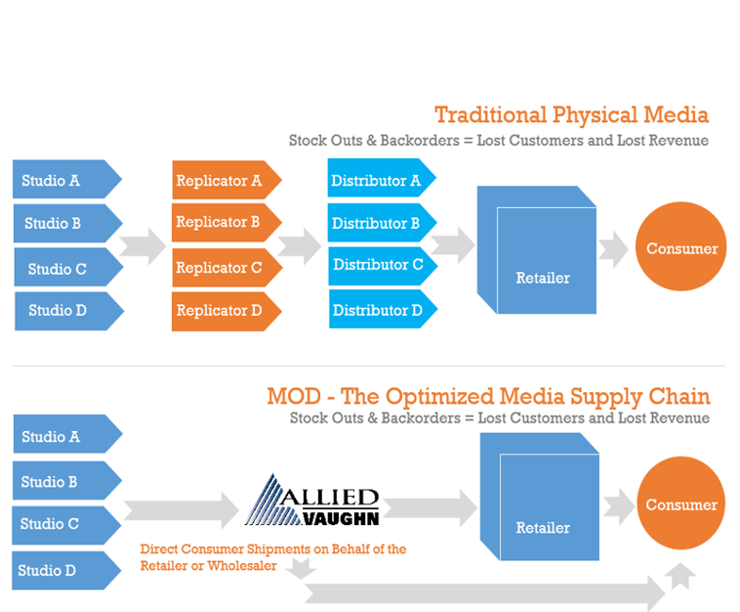 Allied Vaughn pioneered the “zero inventory” Manufacture On Demand (MOD) of physical media products beginning in 2000. Check out what on-demand can do for your business.